Art Journalling With Distress Oxide Inks and Shimmer Spray.Mixed Media. Mixed Media! 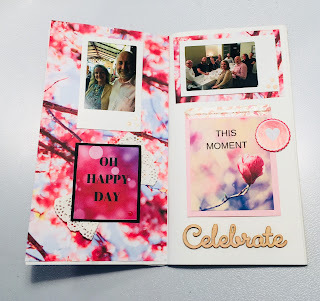 Simple blending, stencilling and spritzing gives a real wow factor to this Art Journal page using Distress oxide inks and Shimmer Spray. Whimsical Art Journal using Dylusions Dyalog Insert by Ranger. This is one of the easiest art journal pages you could ever do. The backgrounds have already been created for you in this Insert book by Ranger. Its the Dyalog "Backgrounds" Book by Dyan Reaveley, and all the work is already done! 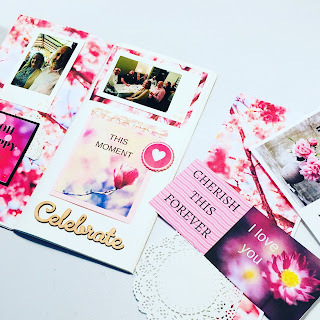 If you are a lover of Clean and Simple (CAS) cards, then this is an easy introduction to creating impressive art journal pages without all the work of layering. The stamp I have used for the main image is the "Blythe Green" digital stamp, which I designed for my ETSY STORE. The sentiment is from Impression Obsession, and the ink is Tuxedo Memento black ink. Creating Embedded Elements within a Frame. Copic Colouring. I wanted to share this new concept with you. It's an idea I came up with that I'm calling "Embedded Frames." I used the Tree builder punch from Stampin' Up! to cut out some "grass" for my stamped puppy and kittens to sit on. In order to achieve this effect, I turned the tree builder pieces upside down, then passed them through the Big Shot with the stitched frames to embed the grass into the background. Next I sponged some sky into the background and placed my kittens and puppy onto the grass, popping them up on dimensionals. I stamped and punched the cloud using the tree builder punch, as you can see from these close up shots. I switched out the colours for moody browns and greys for the tangled kitty. These are the copic colours I used, and I added some sparkly details with the stardust gelly roll pen. The light greys helped these little darlings pop right off the page. I love the way the grass was completely embedded within the frame. I was really pleased with the result, and will use this idea again, as it turned out so well. A simple top-fold card base in whisper white is all that is needed to finish your card. Have a marvellously creative day, and don't forget to check out my ETSY store for more ideas. Travellers Notebook. Emoji Love. Documenting with Simple Stories. Here is the latest in my series of gratitude journals. As soon as one fills up I start another! *New* Pink Blossoms Scrapbook Kit and Chat. Travellers Notebook Layout. This Travellers Notebook Layout is now available for instant download in my ETSY store. I have made a real - time process video of how I covered my Travellers' Notebook and put together this spread using the PINK BLOSSOM SUITE. then add whatever embellishments you have to hand. 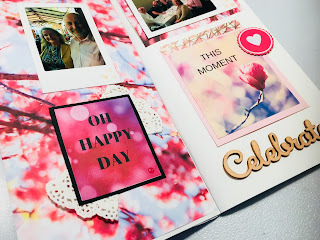 I added a folded paper doily under the "Oh Happy Day" block, which I backed with some black card stock , then added the wooden word "celebrate." I show you how easy it is to custom die this piece by simply using a stamp pad. Some Nuvo drops and a heart-shaped chipboard were added for the finishing touch. I would love to see what you make with this kit! Stamp Storage for Small Spaces. Convert your CD cases to compact storage! Store your stamps in this economical way. 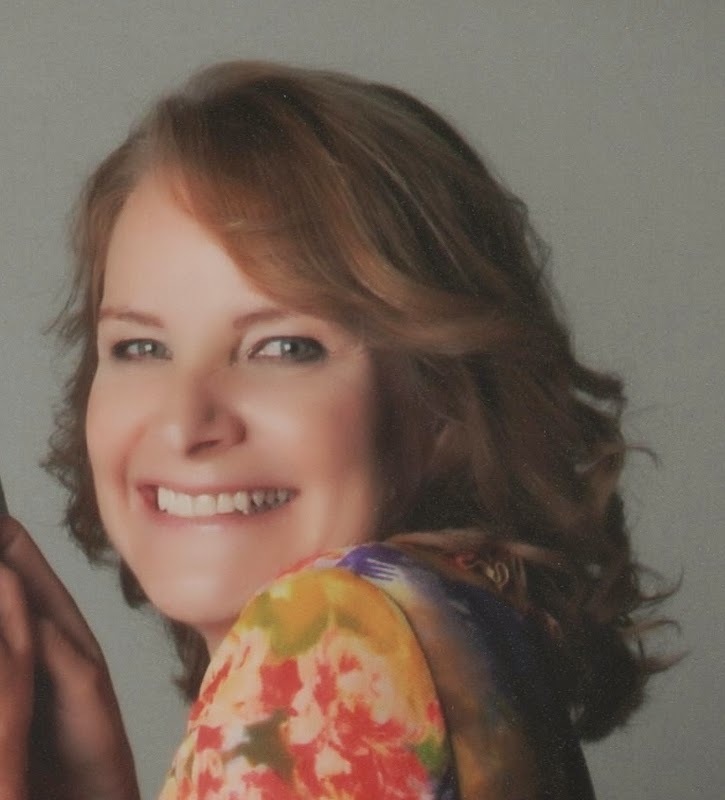 Convert your Stampin' Up! stamps into this slim storage system. If you have LOTS of stamps, like I do, then you might like to try this method. Space saving storage! Love it. WOW! Quote Blocks. Now available in my ETSY Store. If you love scrapbooking, or working in a Travellers' Notebook, then these Quote Blocks might be just what you're looking for. Available from my ETSY store; they also come with 2 A4 sized scrapbook papers to use as backgrounds. They are available for instant download, and can be printed out on a regular home printer, using A4 or US letter sized paper. This is one of my most popular video tutorials. If you struggle with skin tones and blending with Copic Markers, you may pick up a few tips here. Have a fabulously creative day.